We have a garden full of beautiful, colorful flowers. But the resident of our garden that’s been getting the most attention recently is our strawberry. Yes, I meant to write that in the singular. Just one. A single strawberry. At first it was white, and then it started getting embarrassed from all the attention and began to blush, and now it’s red. RED! 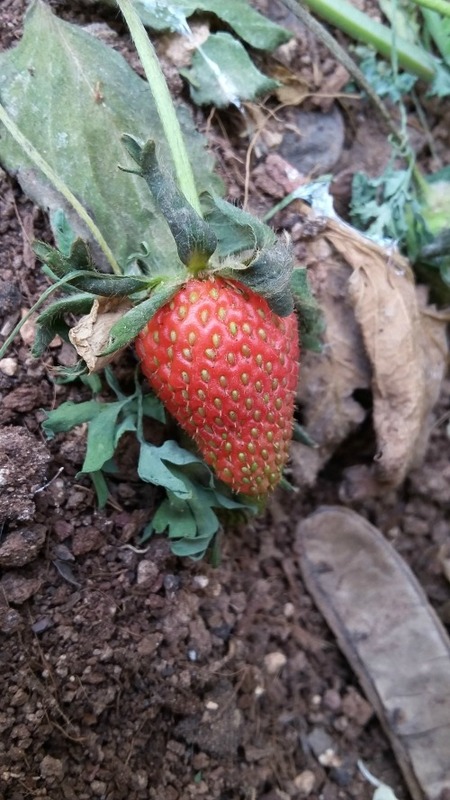 Every day, my husband and I stand by the strawberry he planted with the kids and look at it, debating whether to pick it now or to give it another day to get even redder…We even share photos of it, like this one below, with family members around the world. This morning, walking hand-in-hand with my 4-year-old Yaakov by our garden on the way to gan, I realized that he is like that strawberry. That singular strawberry. Watched. Nurtured. Treasured. I thought of how sometimes I go to the market and see mountains of strawberries for sale. But every child, for that child’s parent, is always that single strawberry. Like the one growing under our kitchen window. How after the war, we Jews didn’t make a war against the Nazis. These people who took each precious Jew– man, woman, boy, girl– and turned us into a swarming mountain of suffering and death. We didn’t pick up weapons and take revenge against the nation that had murdered 6 million members of Am Yisrael. But looking down at my Yaakov, at my child in his kippah, curly blond peyos, tsitsiot down to the knees…in this singular, precious, treasured Jewish child I felt our never-taken revenge, I felt our victory. And the $100 Winner Is...The Motherhood Costume! Beautiful strawberry. Beautiful boy. Beautiful post. It’s hard to know what to tell small children. My kids were complaining about their soup last night, so my husband told them it’s Yom Hashoah, and at least they aren’t eating soup made from a giant pot of water with one potato peel. They asked why the Jews ate soup like that, and we told them the Nazis wanted them to starve and die. So why didn’t they just kill them? Well, they did.So why did they feed them anything and not just kill them all right away? So the Jews could be their slaves like for Pharoah. I think they asked more difficult questions on Yom Hashoah night than the seder night. Wow- from the mouth of babes! 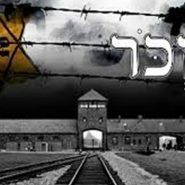 if you ever see the documentary ” a people apart ” you will see a scene where the son of a holocaust survivor says that “every jewish child that is born is a “shtoch” to the natzis.” (yemach shemo) both of my parents were in auschwitz and lived to see children and grandchildren. my father lived to see his great grandchildren. a shtoch in yiddishe is when a person sticks a needle in and it hurts. maybe that’s where they get the expression in english, “to stick it to someone”. Beautiful post. Yesterday I returned to Canada, where I live, after spending 2 1/2 months in Jerusalem, ending on Yom HaShoah. On Yom HaShoah my husband and I took our beautiful 3 1/2-year-old granddaughter to the Nature Museum, where we sat and watched a rehearsal for an event that evening, a concert of klezmer music together with Armenian music, as this year Yom HaShoah coincided with the day commemorating the Armenian genocide. As we listened to “Oifen Pripitchik” and other music of the shtetlach, my husband on one side of our grandchild, I on the other, our little granddaughter listening raptly to the poignant tunes, I got choked up, thinking, “This child was not supposed to be here. But here she is, growing up, and thriving, in Israel.” Yes, that is our way of avenging ourselves against those who hate us (in every generation), our “shtoch” to the Nazis — building this wonderful country together.